Hester Street is named for Hester Leisler, whose father Jacob Leisler was burnt at the stake in 1691 for high treason. Hester married Benjamin Rynders, a prominent Dutch settler, and was the great-great-grandmother of Governeur Morris, one of the chief authors of the Constitution. There was a 1974 film called Hester Street, based on the 1896 novel by Abraham Cahan, Yekl, A Tale of the New York Ghetto. The book, however, mentions Suffolk Street, Chrystie Street and Essex Street--among other Lower East Side streets--but never Hester Street. 217 (corner): There's a peculiar amount of stabbing connected with this address. Abraham Ward was arrested at his home here in 1921 and charged with stabbing to death former police officer John L. Coffey. In 1904, Tomaso Fresi, an eight-year-old resident here, was taken to court after stabbing a neighbor girl in the neck, putting her in the hospital in a dispute over a balloon. And fruit vendor Tony Firia, who lived here, was stabbed in the neck by Antonio Suonatore in 1896, in what sounds like an organized crime attack. 209 (corner): The Grand Machinery Exchange, a 2007 condo conversion of a former machinery warehouse that began life as a stable for police horses. Corner (123 Baxter): Baxter Street, luxury condos designed by Kushner studios. Boasts the Automotion Parking Systems, the Unitone Video Intercom System and the LG Internet Refrigerator. The NY Condo Blog calls it "the Edsel of downtown condo developments" and a "postmodern pastiche of the worst in high-modernism." 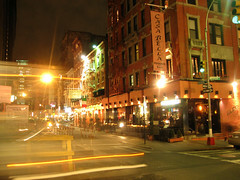 Corner (127 Mul- berry): Casa Bella was co- founded in 1976 by Michael Sabella, a reputed Bonanno capo; in Italian, "Ca' Sabella" means "here's Sabella." 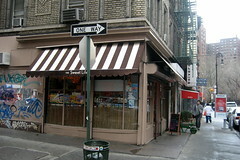 129 (corner): Da Genaro's, named for San Genaro, patron saint of Naples. Was Umberto's Clam House, which on April 6, 1972 was the site of one of New York's most famous mob hits. Joe Gallo, a Colombo soldier on the outs with the family, was shot three times while celebrating his 43rd birthday here. The restaurant was owned at the time by the brother of Matty Ianniello. Corner (119 Mott): Original Vincent's of Little Italy started out as a pushcart on this corner in 1894, and moved indoors in 1904. There's a photo of Frank Sinatra cooking his own pasta in the kitchen; other famous customers claimed by the restaurant include Dean Martin, Tony Bennett and Robert DeNiro. 158: Hester Gardens Mall is on the ground floor of the Hester Gardens condominium. 142: In the film Little Murders, written by Jules Feiffer, a character claims that his family's first apartment was at this address: a "cold-water flat with the bathtub in the kitchen and the toilet down the hall.... Three families used the toilet. An Italian family, a coloured family, a Jewish family.... What they had in common was persecution." 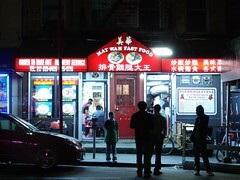 140 (corner): A Bowery flophouse catering to the immigrant Asian population. On the ground floor is Diamond Corner, the beginning of a strip of diamond stores along The Bowery. Corner (80 Elizabeth): Royal Elizabeth Condo, in a four-story building from 1929. Corner (91-93 Bowery): Was the Music Palace, the last Chinese-language movie theater in Chinatown; it went dark in 2000 and was demolished in 2006. In 1919, it was the Universal cinema. 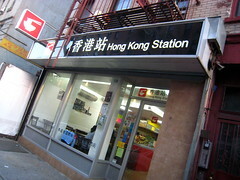 128: Hong Kong Station, noodle bar. This address was the birthplace of Isaac Thomas Hecker (b. December 18, 1819), the founder of the Paulist religious order. 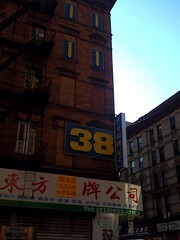 Corner (69 Chrystie): Lucky Star Bus Line, ultra-cheap tickets to Boston--plus bootleg movies en route. 149 (corner): Crystal House of Chinatown. On the Bowery side of the building is the Bowery Pharmacy. 137 (corner): Dong Dong Hair Salon, Li Xing Florist, Hoo King Housewares. Named for FDR's mother, a formidable woman who took credit for her son's political success, and who was something of a terror to her daughter-in-law Eleanor. The park is the result of massive slum clearance in 1929; it was supposed to be replaced with public housing, but corrupt city land deals made the price prohibitive. One block wide and seven blocks long, this park is cited by Jane Jacobs as an example of unappealing park design, though it's been improved lately. 100 (block): IS 131, a New York City junior high serving the Chinatown neighborhood, is in a curvilinear Modernist building from 1983. Also houses Pace University High School, a collaboration launched in 2004 between the college and the city Board of Ed. 113: Hester Street Collaborative, a nonprofit dedicating to improving the physical environment of underserved communities. Corner (60 Eldridge): Songwriter Ira Gershwin was born in this tenement building on December 6, 1896, when Simpson's Pawnshop was on the ground floor. Block (45 Allen): Oppressive-looking 14-story public housing building. 70: This three-story building, designed in 1881 by Frederick Jenth with Moorish-style windows, was the site of the First Roumanian-American Synagogue, serving a congregation organized in 1860. 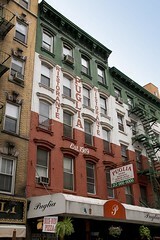 It relocated in 1902 to a larger building on Rivington Street, where they stayed until the roof caved in in 2006. Corner (37A Orchard): CitiProps Inc.
60: This building was designed in 1901 by architect Ernest Flagg to provide increased lighting and ventilation for low-income renters, becoming the prototype of the New Law Tenement. 56 (corner): Six-story building from 1930. Classic Coffee Shop is on the ground floor. 71 (block): P.S. 42, a handsome red-brick elementary school completed in 1898 to Charles B.J. Snyder's Neo-Renaissance design. Named in 1916 for the retailer, philanthropist and art collector, who died in 1913; his family's first store was nearby on Attorney Street. 61: Brown Cafe and Orange Cafe. 59: Author Anzia Yezierska lived in a basement apartment here; her stories of Lower East Side life were collected in the volume Hungry Hearts, which was made into a 1922 film. The basement is now the L.E.S. Workers Center/ Centro de Trabajadores de Loisada. 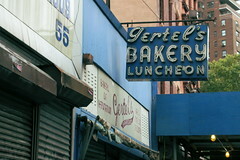 55: Was Galore Tile Corp.
53: Was Gertel's Bakery -- "bakers of repu- tation," famous for their rugelach and challa bread -- opened in 1914, closed 2007. Now demolished. 51: Cool street fashion/guerrilla media boutique. 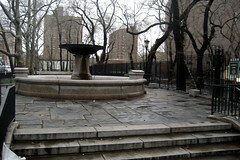 This park was established in 1899 by the Outdoor Recreation League, replacing crumbling tenements that were torn down in 1897. It's named for William Seward (1801-72), an early abolitionist who became NY governor (1838-42) and a U.S. senator (1848-61), he served as secretary of state under Lincoln and Andrew Johnson. He's most remembered for paying Russia $7 million for Alaska in 1867. But it's his pro-immigration policies that made him the namesake of this park serving an immigrant neighborhood. 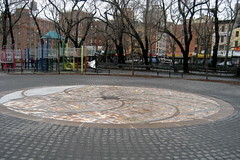 The northern part of the park was made into a playground in 1903--the first munipal playground in the U.S. A public bath--the first in a New York park-- was built here in 1904 and demolished in 1936, replaced by a recreation building in 1941. The Schiff Fountain, paid for by financier Jacob H. Schiff and designed by Arnold Brunner, was built in 1895 in Rutgers Square and moved here in 1936. Numerous Tai Chi practitioners can be found in the park every morning. What am I missing on Hester Street? Write to Jim Naureckas and tell him about it.